ANNAPOLIS, MD (May 01, 2016) – The spotted lanternfly, (Lycerma delicatula) is an invasive planthopper. It attacks many hosts including grape, pine, stone fruits and tree of heaven and has the potential to greatly impact the grape, fruit tree and logging industries. This is a new pest to the United States, having been found for the first time in nearby Pennsylvania a little over a year ago. The spotted lanternfly could spread rapidly and could cause both economic and environmental damage. Because the eggs hatch in late spring, and the early instars become noticeable, it has been chosen as the Maryland Invasive Species Council's May Invader of the Month. The adult spotted lanternfly is about 1" long and 0.5" wide. Its front wing is grey with black spots. The front wing tips have interlacing black blocks outlined in grey. The hind wings have alternating red, white and black bands. The insect's legs and head are black, and its abdomen is yellow with broad black bands. Young nymphs are black with white spots. Older nymphs are red with white spots. Eggs are yellowish-brown, laid in masses of 30-50 eggs in four to seven columns. The egg masses are covered with a grey waxy substance. The spotted lanternfly is native to China, Japan and Vietnam and introduced in South Korea. The insect was discovered in Berks County, Pennsylvania in September, 2014 — the first detection of spotted lanternfly in the United States. Currently, spotted lanternfly has been found in four counties in Pennsylvania: Berks, Montgomery, Chester and Bucks, all in the southeastern corner of the state, and close to Cecil and Harford counties in Maryland. Spotted lanternfly is not a native of the United States. It has become an important exotic invasive pest in South Korea, where it has been recorded feeding on 65 species of plants. Of those 65, 25 occur in Pennsylvania (and also in Maryland). It is known to feed on many plants including apple, plums, cherries, peaches, nectarines, apricots, almonds, pine, oak, walnut, poplar and especially grapes. Spotted lanternfly young and adults harm trees by sucking stem and leaf sap, which compromises the tree's photosynthetic capabilities and weakens it. If allowed to spread within the United States, spotted lanternfly could become a serious economic threat to the grape, orchard and forestry industries and the environment. It can spread rapidly into new areas. Its long distance dispersal is facilitated by people moving infested materials with egg masses on them. 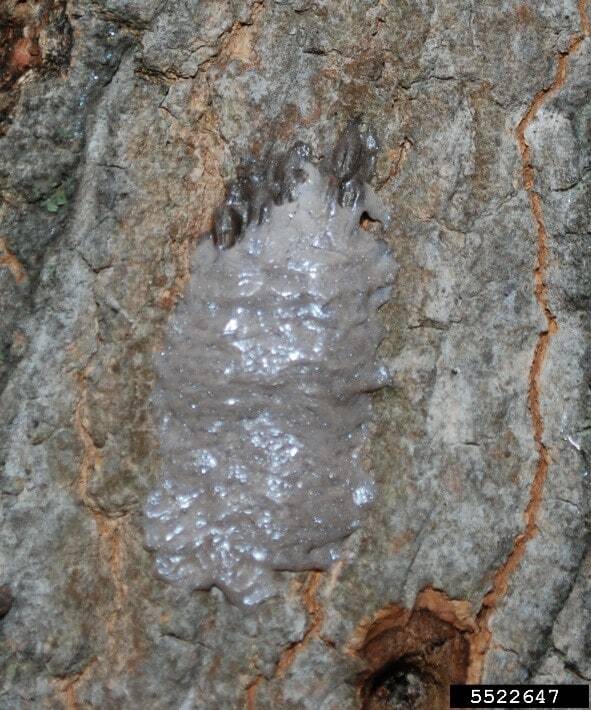 Egg masses are usually on smooth barked trees and smooth surfaces like stone, outdoor furniture, vehicles and other structures. Spotted lanternfly has not been found in Maryland. The best place to look for it is in clumps on the bark of tree of heaven, another Asian invader, in late summer or early fall. It is too soon to tell whether this spreading pest will function as an effective biological control agent for tree of heaven. In the summer, grape is a favorite food of the spotted lanternfly. If you think you have found spotted lanternfly, contact the Maryland Department of Agriculture, Plant Protection Section, at 410-841-5920. To prevent this insect's introduction into Maryland, do not bring uninspected materials from the quarantined counties of Pennsylvania. Also, carefully inspect rock and stone materials bought from commercial establishments for the spotted lanternfly and its eggs. For more information on the Internet: Pest Alert: Spotted lanternfly, United States Department of Agriculture. Spotted lanternfly, Pennsylvania Department of Agriculture.